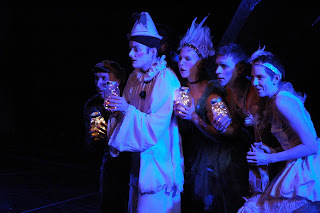 Once upon a time I went to a show, and it was called Burning Bluebeard. It was really scary, and I loved the plot of it which was how they really wanted to make moonlight for the audience. There was a really cool soundtrack at the end that sounded like the Iroquois Theater fire itself. The Iroquois fire was a really sad time, and it is not a very funny thing because lots of children and grown people died. All the people that were sitting in the balcony all died because they were trying to make moonlight and the fire curtain was stuck on something and also on fire, so the whole balcony died. When they made moonlight, one of the set pieces caught on fire. And to make moonlight they used double awful electricity that was different from our electricity that we use today. One of my favorite scenes was one that was like an old-fashioned cartoon--like the old-fashioned Mickey Mouse where nobody really talks. The clown (Dean Evans) was miming a butterfly catcher in love with a beautiful girl (Molly Plunk) who got taken away by Bluebeard (Anthony Courser) which made the butterfly catcher hang himself, but then this weird baby came along and untied him, walking along the rope in a baby kind of way. That was weird--but pretty awesome. I liked this scene a lot because it is so funny that this clown thinks that this happy baby thing looks like it is coming from the play about Bluebeard. I don't think any play about Bluebeard killing all his wives would have a baby untying somebody from a tree trying to help him not be so sad over Bluebeard taking a girl that he likes. At the end Eddie Foy (Ryan Walters) said, "What did that have to do with Bluebeard?" I think the clown wanted to put it in because he is trying to make himself actually the main character of something. The clown kind of doesn't want the people to die, but he kind of wants the fire because I think he kind of thinks, "This is our story, we can't make it anything else." It is a really sad story--more than 600 people died--but he wanted to make it interesting--he wanted it to be an exciting story. There are sometimes funny parts in this show even though it is about the Iroquois fire which is a very sad thing. And this is one of the funny parts. The stage manager (Jay Torrence) is singing a song called Rehab. It is a woman singing Rehab and he really does a good job lip syncing. He is holding a baby doll with a baby bottle he is making it drink from. It is really funny, but also really kind of amazingly awful because the baby is supposed to be a real baby but he drops it on the floor. I think he is really supposed to do that--and that is just a little disturbing. I think the stage manager sang the song because he is trying to prove the clown wrong. The clown is trying to tell the stage manager that he can't actually do a show because the clown thinks he can do a better show than him. In the scene where Nellie (Leah Urzendowski) is flying across the stage and is throwing out flowers, she is trying to make the people that come to the play have something they will remember for life. She really wants them to feel like there is somebody really special flying over their heads, that they really want to be seeing this. She likes it, so she really wants everybody else to like it. She is one of the characters that doesn't want anyone to get physically hurt. The performers really want to connect to the audience and make them happy and don't want to make them be angry at them because they did a bad show. They always want to do a good show so that the audience can remember that they went to go see the show. Bluebeard in real life was not a good show, but Burning Bluebeard is amazing. I can't believe that the characters would leave you alone in the dark with a dead person and a creepy soundtrack. They just want theirselves to be safe, except for Eddie Foy because he wants his son to be safe. They kind of want you to feel not safe, but they kind of want you to not die. You kind of feel heartbroken that the characters don't really care about the audience, but you know it is not actually happening, but you kind of feel like it is really happening. Then they actually make you happy at the end. I thought it was really super sad. It was really hard to talk about it because it was one of the saddest fires in the world. But they are mostly not talking about these more than 600 people dying. They are really talking about how they want to make moonlight because moonlight stands for happiness, and they want you to love the show. The actors want the audience to love the show. They really changed the space so it really looked like the real Iroquois Theater after the fire. When I first came in I was expecting a stage like Barrel of Monkeys only without the monkeys, but the whole space was changed in a cool but creepy kind of way. When we walked in into the open room there were all these packaging-tape babies and hands. Hands because lots of people died and the hands were like sticking out of the walls. Whoever made those had to be a really good artist. Halena Kays who directed this also directed Daredevil Hamlet. Daredevil Hamlet was also an amazing thing. They had a grown man ride a tricycle up on a ramp and jump off the ramp--the tricycle was like a motorcycle, and it was so awesome. And the man who played Ophelia held his breath underwater for a long long long time. She likes to have amazing tricks in her shows. 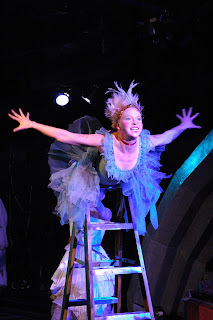 In this show, the fairy came out of an amazingly small box eating potato chips. There were these three people, and they did back flips over and over each other. I think Jay Torrence decided to have this play go on because I think he was very interested in the Iroquois fire and how the actors would feel about the fire and how they wanted to make moonlight for everybody but they couldn't. Instead they burned down the building. They feel very sad for all those people. I think he is interested in it because he wondered what it would be like to actually kind of be in the Iroquois fire. He gave the audience a feeling that they were actually there, which would scare them and make them like the show more. Like I said in my Walk Two Moons review, people think, "What is the use of going to see a sad show if it is going to be sad?" Because you actually don't feel that bad because it didn't just happen. It happened a long time ago, and it is not going to happen anytime in this century because we are more careful about the consequences of what might happen if they try to make real moonlight. So the scientists tried to make it so there would never be a fire like that again because we have better electricity now.The point of going to a sad play is that you feel happiness after because you've seen an amazing play and you know it has not actually happened. And you think of it as a dream, but you actually went to the play. People that would like this show are people that like acrobatic tricks, history, tragedies, and moonlight. There wasn't a big smile on my face the whole time, but you still feel happy even though you are seeing something sad. I think this show should be for very brave seven year olds and up. Ada Grey Reviews for You LIVE! 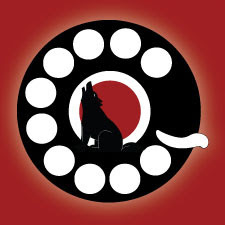 This Monday, November 21st, 2011, you can see Ada Grey and Time Out Chicago critic Kris Vire deliver a live, on-the-spot review of Strawdog Theater Company's Benefit Performance The Phone Book. What will Ada and Kris make of a short piece by Brett Neveu, Dennis Watkins' magic, Improv Shakespeare, and Strawdog parodies of Mamet and Pinter? You can find out ONE NIGHT ONLY: November 21st at 8pm (doors at 7). Tickets are going fast, but a few are still available from the Strawdog Theatre Company website. Once upon a time I went to a show, and it was called Walk Two Moons. It was a really good show. The show is about a girl named Salamanca (Tanya McBride) whose mother has gone away because she doesn't think she fits in with everyone else in her family. The mother (Casey Cunningham) died on a bus right before her last birthday. Sal and her grandparents (Sandy Elias and Millicent Hurley) need to try to get to her mom before her mother's birthday because she wants to see her mother's grave on her birthday because she feels like she can see her one last time. The other story is that she was telling a story to her grandparents on the trip about one of her friends. Her friend Phoebe's mother went away to find her lost son. Sal is trying to tell the audience about two things that happened that were similar--to her friend and her--but not exactly the same. In the first car scene, Sal is praying not to get into an accident, and she is telling her grandparents a story all about Phoebe. This is the first scene where you meet the grandparents. The grandparents are important because they are taking her on the journey to go see her mother. They are trying to make her accept that her mother is dead in a nicer way than just telling her. They visit all the places that her mother had gone to on her journey. When Phoebe and Sal are sitting at the table, when they found out that Phoebe's mother has gone missing, Phoebe's father (Michael Peters) says, "Let's not malinger." And then Phoebe says "Malinger? What does that mean?" And then he says, look it up. And then when he hands her it, she says "My mother is missing, and my father hands me a dictionary!!" I think this line shows that she really needs to find her mother and she is really really upset about it. She feels flabbergasted about her father giving her the dictionary because looking in a dictionary is not helping to find her mother. In the scene where Mr. Birkway (Joe Zarrow) is reading the journals of the class, I thought it was really funny when he read "kisses taste like chicken." Kisses do not taste like chicken, and I know that. Except for somebody that has just eaten chicken. The class learns all about Sal's mother's blackberry kiss. Her mother kissed the tree and Sal thought that she could find a little black stain on the tree that was of a blackberry kiss. Sal thinks of trees as being like god. She thought of her mother as being kind of her guide when she was alive. When her mother died, she thought about the blackberry kiss, and then she thought that trees were the closest thing to her mother. So then they were kind of like her second mother. The sleepover scene was a great scene. I liked how Mrs. Cadaver (Dani Bryant) was walking around with a flashlight and it kind of showed that she was outside in the dark. And the part of the stage she was on was dark, and she pretended to chop down trees. Phoebe (Baize Buzan) really seemed like she needed to find out in the scene what Mrs. Cadaver was doing, and she really needed to find out what happened to her mom. Mrs. Cadaver looked real creepy because her hair looked really witchy and messy like they said in the book, and it was red like they said in the book. She looked a lot like I imagined her. It was suspenseful because you are afraid that Mrs. Cadaver is going to see Phoebe and Sal because they are in plain sight, leaning very far out the window. Then, because you think she's a murderer, you think she is going to chop their heads off. In the scene where Sal and Phoebe are in the dark with Mrs. Partridge (Millicent Hurley) they are going to try to sneak in and find clues about how Mrs. Cadaver killed Mr. Cadaver and killed Phoebe's mother. That is what they think she has done. I liked how they found mysterious blood stains on the rug because Phoebe marks them somehow and she finds out that even though Mrs. Partridge is blind, she can tell who she is and that she's kneeling down. I thought that was cool. She is kind of like a fortune teller--only a very old fortune teller. There was a scene that creeped me out where Sal's Gram gets bitten by a snake in the ankle and they have to get the venom out. I thought it was scary when they had to get the venom out because they had to rip a bigger hole open and she was screaming. I think they chose to do it offstage because there were some pretty little kids there and it would be kind of scary to see someone get a big snake bite. You know they are in the water offstage because you hear a big splash and then "Come on in, Chickabiddy." I think I know why they didn't do it onstage; because it would be kind of hard to actually have a snake that looks like it is biting somebody. And it is not very easy to have a river on stage either. There is an unknown boy (Kyle Johnson) that comes up and says, "this is private property." And Gramps says something like "I never heard of a lake that was private property, and I didn't see a sign." I liked this part because it's suspenseful. You are thinking that it actually is private property or something like that. You are worried about something else while she is getting her snake bite, but then--when you find out that she's gotten her snake bite--then you are worried about that and the other thing is over. There was a kind of confusing part in this play when Sal was in the car. It looked like she and Phoebe were in the same scene, but I am not positive they were. Sal was not in Phoebe's house; she was so far away from Phoebe that they couldn't be in the same room together. Sal was talking to Phoebe's family from inside the car, but Phoebe is in Ohio and Sal is in Lewiston, Idaho. I think she was thinking about Phoebe and how she was getting along with the Lunatic (Kyle Johnson) as a brother. Usually when a person in a movie or play is telling a story, they show you what's happening in the story so then everybody knows what is happening better. Sal isn't telling a story in this scene, but she is imagining. It took me just a few seconds to figure out that she was imagining this because these times were actually pretty close to each other, but not too close. The set was really cool. It was done by Simon Lashford. I really liked the swing that was swinging on the tree. I liked it because Sal talked a lot about having fun on the swing tree, and I thought that really brought out how much fun she had on it. I liked how they did the car. They had a steering wheel and seats that looked like car old-fashioned seats from like Harold Lloyd time. And they also had a backseat that was like the front seat but without the steering wheel. This play is a very very very sad play. Lots of people die, mothers go away from their children, people don't always get to live wherever they want. You like seeing sad things because sad things can sometimes make you happy. It is not like it is heartbreaking and you are going to die of sadness because it is not really happening, and you know it is not really happening because they are just actors. It makes you sad, but when you come out you are so happy that you saw such a great play about sadness. I think people that would like this show are people who like mysteries, secrets, going on long trips, and getting to be happy and getting to be sad almost at the exact same time. I think this play should be for ages seven and up. I was just the right age. I think this play is heartbreaking, but it makes you remember how precious your parents are to you.